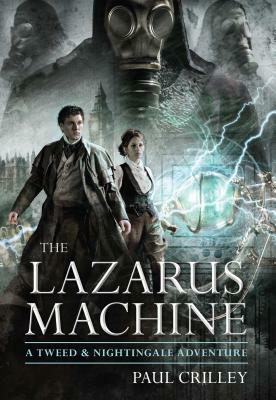 Steampunk adventure for fans of Sherlock Holmes and Doctor Who An alternate 1895, A world where Charles Babbage and Ada Lovelace perfected the Difference Engine. Where steam and Tesla-powered computers are everywhere. Where automatons powered by human souls venture out into the sprawling London streets. Where the Ministry, a secretive government agency, seeks to control everything in the name of the Queen. It is in this claustrophobic, paranoid city that seventeen-year old Sebastian Tweed and his conman father struggle to eke out a living. But all is not well. A murderous, masked gang has moved into London, spreading terror through the criminal ranks as they take over the underworld. As the gang carves up more and more of the city, a single name comes to be uttered in fearful whispers, Professor Moriarty. When Tweed's father is kidnapped by Moriarty, he is forced to team up with information broker, Octavia Nightingale, to track him down. But he soon realizes that his father's disappearance is just a tiny piece of a political conspiracy that could destroy the British Empire and plunge the world into a horrific war. "Crilley's newest is a wild ride....Even the setting is intriguing: an alternate 1895 complete with computers, automation and a super-secret government agency. You'll love the quirky one-liners and the nonstop action." "At times witty and snarky as well as suspenseful and terrifying, this story grabs readers immediately and propels them along the streets of London in what is an alternate 1895. Automatons, computers and steam engines give this book a feel both futuristic and fantastical. The instant connection between Tweed and Nightingale is believable and the reader will eagerly await the sequel to see what is in store for these two. …Even those readers who do not embrace the steampunk genre will love the pacing and mystery of this story. Highly recommended for ages 12 and older." "An excellent steampunk YA adventure novel.... If you like your action/heist tales dressed up in goggles and greatcoats, this is a perfect choice." "If you're a fan of mysteries, science fiction, and witty dialogue you'll definitely want to pick up a copy of The Lazarus Machine!" "One of the richest Steampunk stories I have read, period."